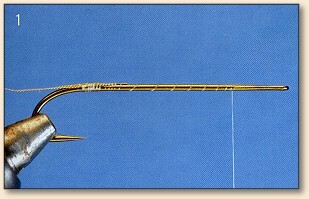 "Thunder Creek Brown Trout - FAOL"
According to the essay "A Brief History of the Thunder Creek Series," which appeared in Joe Bate's book Streamer Fly Tying & Fishing ..., Keith Fulsher tied the first members of the Thunder Creek Series in 1962. In 1972, he published his book Tying and Fishing the Thunder Creek Series...A few years later, he contributed articles to the first editions of Fly Tyer magazine in which he described new patterns and ways to dress Thunder Creeks. Many members of the Thunder Creek family are about forty years old, and I consider them modern classics. Keeping with that theme, I'm going to show you how to tie an updated Thunder Creek Brown Trout. Rather than lacquering the head of the fly, as Keith did, I am going to use epoxy. And rather than painting the eyes, I am going to use adhesive Mylar eyes. I'm also going to add a few pieces of Krystal Flash to the wing to give the fly extra fish-attracting sparkle. 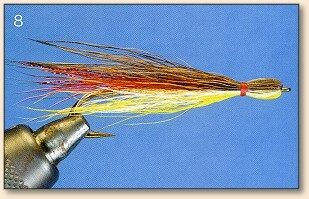 Tie this fly and go catch some fish! 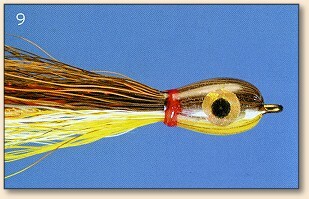 Hook: Straight-eye streamer hook, sizes 4 and 2. Thread: Clear monofilament for tying the body, and red 6/0 for tying off the head. 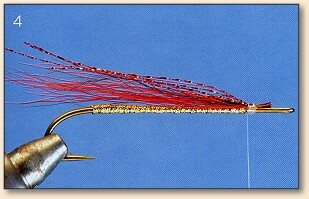 Underwing: Red and black bucktail, mixed together and tied on top of the hook, and red Krystal Flash. Belly: Yellow and white bucktail. 1. 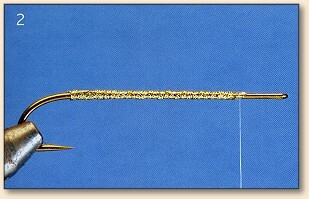 Start the monofilament thread near the end of the hook shank. Tie on a piece of gold-embossed tinsel. 2. Wrap the tinsel up the hook shank to form the body. 3. Mix together a few pieces of red and black bucktail. Tie the bucktail on top of the hook. 4. I'm tying a slightly modernized version of the classic Brown Trout Thunder Creek, and am adding four strands of red Krystal Flash to the underwing. 5. Clip a small bunch of natural brown bucktail. Remove any short hairs from the bunch, and even the tips. Tie the bucktail to the top of the hook with the tips pointing forward. 6. 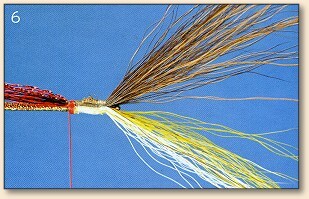 Mix together two very small bunches of white and yellow bucktail. 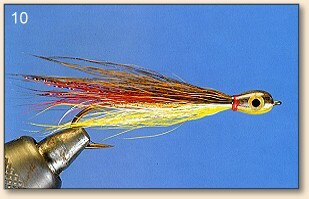 Tie the bucktail on the bottom of the hook with the fibers pointing forward. Wrap the thread to the base of the underwing. Tie off the monofilament thread and clip. Start a spool of red thread. 7. 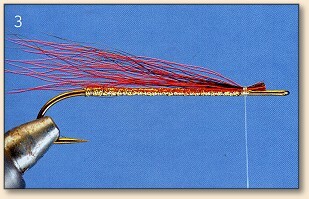 You'll want to keep the bunches of bucktail separate when you fold the material back to form the wing and belly of the fly. It helps if you apply a dab of dubbing wax on the tip of each buch. Lightly twist the hairs when you apply the wax. Don't get wax on the bucktail near the hook shank; the last step is to coat the head with epoxy, and the wax will prevent the glue from clinging to the hair. 8. 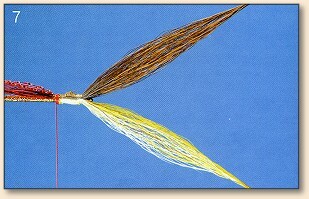 Fold the bucktail back to form the wing and belly; make sure that the hairs cover the sides of the head. Make two or three wraps of thread. Pull the hair back to form a trim head, and tighten the thread. Make three more firm wraps of thread. Tie off the thread and clip. 9. Keith Fulsher covers of the head of a Thunder Creek with two coats of varnish, and then paints an eye on each side of the head. I prefer using one coat of epoxy. Place an adhesive eye on each side of the head. Coat the head with five-minute epoxy. David is the editor of Fly Tyer magazine. In addition to traveling far and wide in search of good fishing, he also makes split-bamboo fly rods. His articles have appeared in many American, Canadian, and Japanese angling magazines. This fly is an excerpt from his book, Tying Classic Freshwater Streamers, published by Countryman Press. He has also authored three other Countryman Press books: Trout Streams of Northern New England, Tying Contemporary Saltwater Flies and Guide Flies. 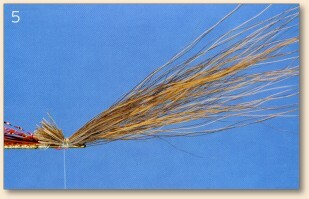 For more great flies, check out: Beginning Fly Tying, Intermediate Fly Tying and Advanced Fly Tying.